I’m guessing there were about 100 people in attendance at the Chili Fest here at Imperial Dam LTVA. It was just about 80º this afternoon in February! I just came in from the Chili Fest where something in the neighborhood of 100 people gathered for chili, chili dogs and a smorgasbord of desserts. The cost of entry, zero, zip nada. “What can I bring?” I asked when I was first invited and again a week or so later when I stopped by the host’s RV to confirm the day and time. “Nothing… just your chair” came the reply, both times. “Something for me to drink?” I asked. “Yeah”. 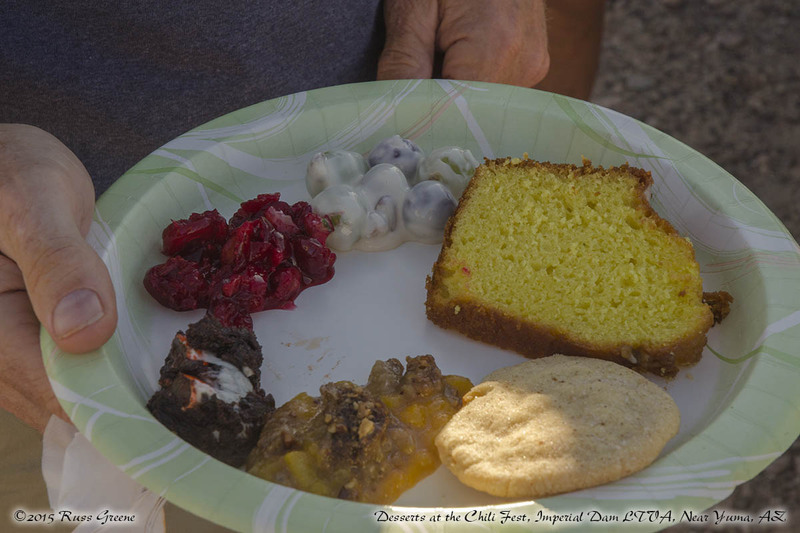 No Chili Fest is complete without an assortment of desserts and there were more than you could shake a fork at! The Chili Fest here at the Imperial Dam LTVA is something of an annual event, I gather, coordinated by none other than the campers themselves. Publicized, at least this year, by Cora who I understand took the time and initiative to go to all corners of the LTVA and personally invite everybody to the event. I’m told there were also announcements about the event on CB radio channel 12 which is the favorite haunt of the LTVA’s CBers and it may have garnered mention in one of the camper published newsletters. It was hosted by Cora and her husband Merle. Being an Imperial Dam LTVA newbie I don’t know if they are the usual hosts or if the volunteer hosts change from year to year. 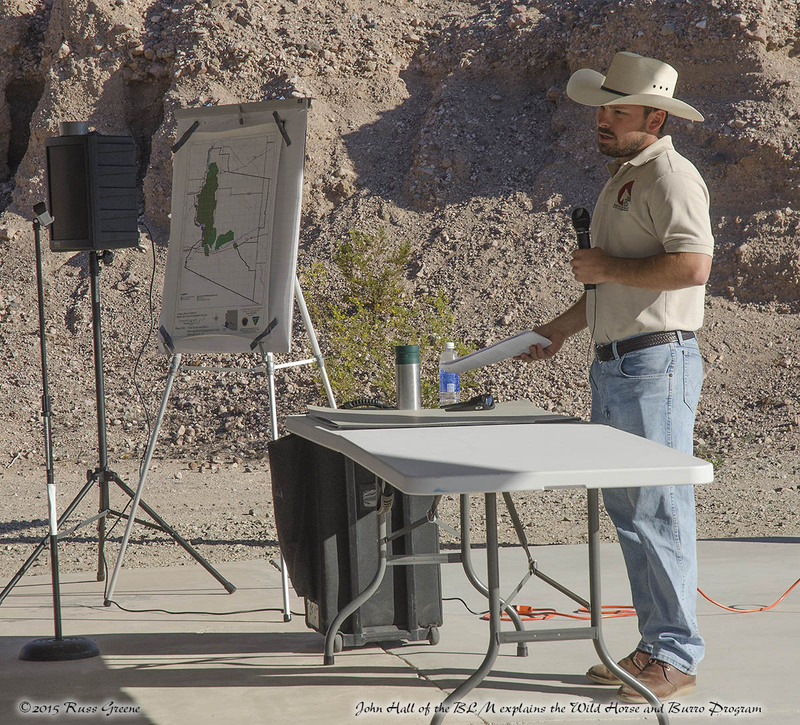 John Hall of the BLM tells us about the wild burro and horse program. 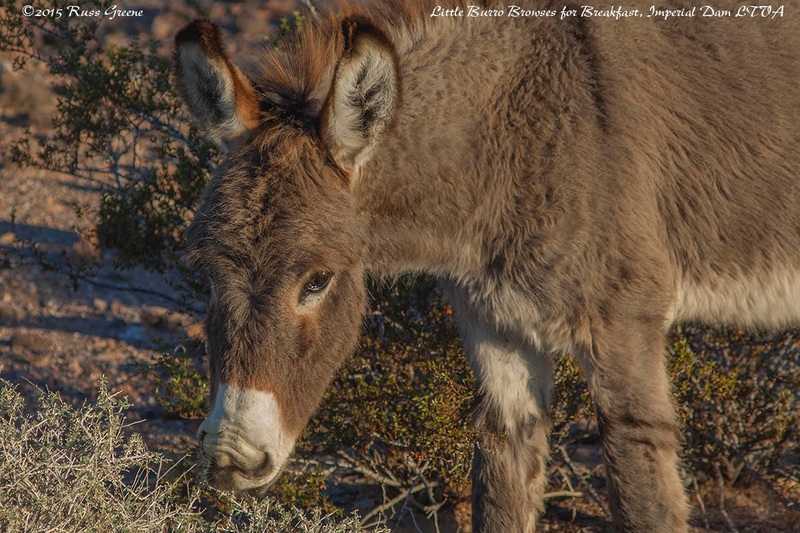 You can adopt a little burro! They’re so cute, at least when they are little. Later I was told that the chili fest was paid for by the hosts Cora and Merle, and perhaps another couple too. Forgive me, please, if I have the facts wrong. I’ll correct them when new information comes to my attention. This Little Burro is just so cute. Don’t you think ? He lives here too. 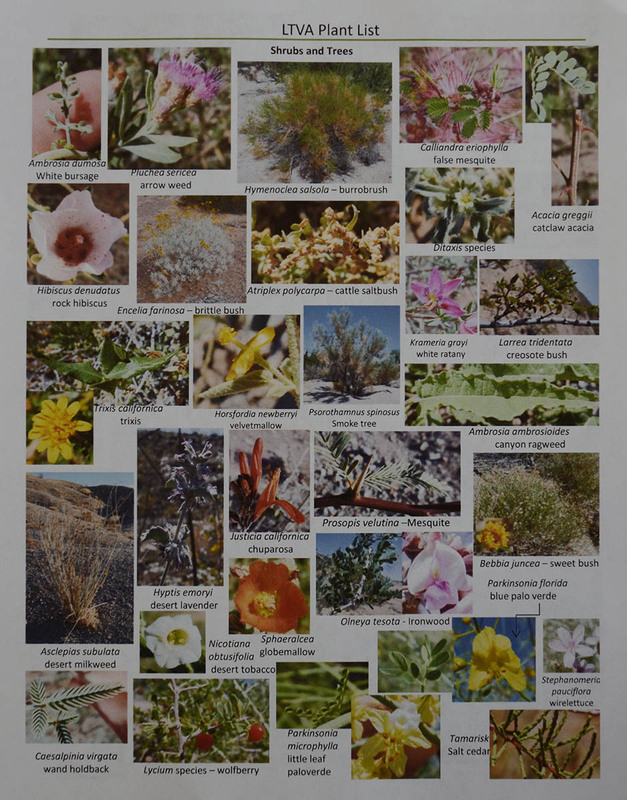 Oh, and something I didn’t include in the list of activities above, only because it was not organized by the campers, was the presentation made today by the BLM, but more on that in a moment. This crowd of 100 or so gathered at the Chili Fest in their finest shorts, t-shirts and sandals on this sunny, 80º summer day. Oh wait, did I say summer? IT’S FEBRUARY! My mistake, but sunny and 80º it was. For all intents and purposes it was summer. We basked in the delicious afternoon sun, or shade if you preferred and could find some, as we dined on the aforementioned edibles, sipping margaritas from the open bar, were entertained by a troupe of Hawaiian hula dancers, followed by a short medley of her biggest hits in a live performance by Katy Perry. Oh… OK… I made up the part about Katy Perry… ummm… and the Hawaiian hula dancers… and the part about the margaritas, but it could happen! Now as to my mention of the BLM above, well, for the uninitiated, the BLM is the Bureau of Land Management. It’s on their property–or rather yours and mine since as a government agency they work for us managing our public lands–where this whole shindig happened. Regular readers of this blog already know about the BLM. More can be gleaned elsewhere should you need to know. Anyway, the BLM came to the LTVA today to TALK. What’s TALK? It’s not an acronym in this case, just upper case in this case… I’m just playin witchya. They came here to talk, to make a presentation to the campers here, or rather seven separate presentations: Wild Horse and Burro Program, Flowers and Plants, Recreational Mining, Local Ecology, BLM Law Enforcement, LTVA Management and finally, History of the De Anza Trail. Things got underway at 0900 (why can’t they just say 9 o’clock like everybody else?) and went to 1430, whenever that was. Yours truly was there to hear all the talks, and they were all terrific. Thank you BLM! I’ve said it before and I’ll say it again, the sunsets here in the desert art just the best! On the downside I had to take a pass on today’s Thursday morning hike in order to attend the BLM show, but with the Chili Fest that followed it was a rather full day. 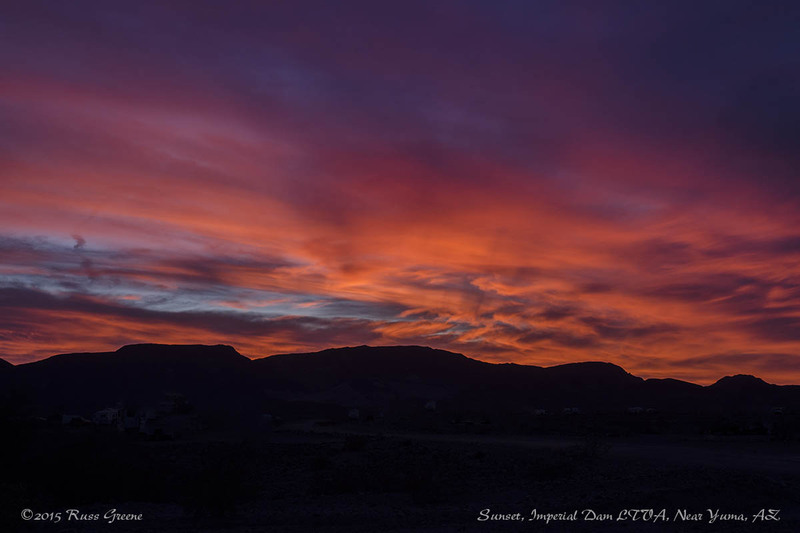 Bringing the day to a spectacular close was the same warm sun that had softly kissed our skin a few hours earlier, now disappearing behind the mountaintops in her usual desert-sunset splendor, gently whispering good night and sweet dreams. Good night Ms. Sun, and thanks to you and your cloud friends for a most beautiful sunset. 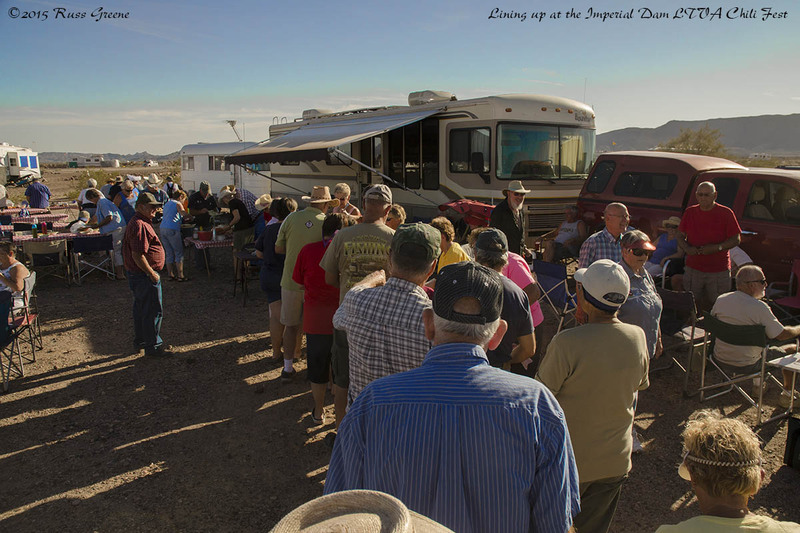 I have also written a Boondocking Report on the Imperial Dam LTVA, here. What a wonderful thing you are doing Russ. Thank you for helping me dream of my next snowbird adventure. Carol and I will be at South Mesa in November of 2016 and plan on staying until spring. I’m sorry to impose on you with a trivial questionI I haven’t been able to have answered. I understand that I can get propane at the Christian Centre but can they fill my installed 10 galon motorhome propane tank? No trouble at all. Glad to help. It’s the Christian Service Center, 2225 Ferguson Rd, Winterhaven, CA 92283, (760) 572-0821. I got that info online via a Google search but didn’t see that the center itself has a web presence. I’m pretty sure that they can fill tanks built into RVs as there are so many in the area during the RV season, but maybe you should give them a call just to be certain and not worry about it. You can also arrange to have mail delivered there by registering with them when you arrive. There’s no charge. Another great service is that you can use their computers and wifi in their computer room. They suggest a small donation, which is optional. It’s great to have them there. It can still be hot down there in early November and people start clearing out perhaps as early as February. I think I left about mid-March and it was getting pretty hot by then. If you haven’t already it may be worth doing some research as to temps and plan your stay accordingly. It certainly seems to be a very unique place. I can see why people return here for months at a time, year after year. The sunsets alone would be reason enough for me, they are so achingly beautiful. They floor me with the beauty of nature and fill me with joy.